The autumn weather has come and with it the blunt reminder that Winter will not be long now. The best way to combat The Frost Giants? Soup, of course. So this week, I broke out the slow cooker to try my hand crafting some soups. I will share both recipes but for today, just one. Mainly because there was a lot happening with this, almost like two dishes in one. I will explain, for this soup, I didn’t want to use a pasta. I wanted to keep the carbs down and try to keep it as healthy as possible. So, I swapped out the Pastina for spaghetti squash. 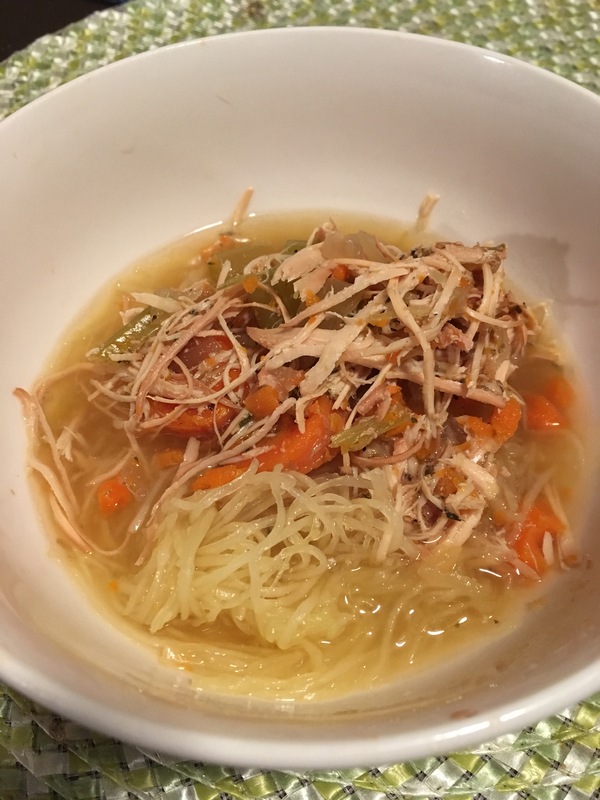 I love spaghetti squash, so why not try this? I took all of my spices for the soup and mixed them in a bowl with some olive oil and cut the squashes in half. I placed them on a rack with the cut sides down. I then took my basting brush and covered both sides with the mixture while the over preheated to 400 degrees. The squashes took 45 minutes to cook. Once removed, they let them cool down for 20 minutes and they were still hot. So, I took the extra step of handling them with an oven mitt on one hand. I removed as much of the seeds that I could with a tea spoon. Then I began to scrap out the inside of each half. I scrapped until only the outer skin was left. Now, this can sit off to the side in a container, since I wouldn’t be needing it for a while still. It looks great already. While the squashes were roasting, I went ahead and started to season my chicken breasts. I used whatever spices I could think of and mixing them in bowl. I then covered each breasts in spices and let sit in a large bowl. The bowl went into the refrigerator for an hour. I cut up my carrots and celery and put them into the slow cooker. Followed by all of the spices and 6 cups of low sodium chicken broth and added 2 cups of water, to cut come of the sodium down. Once that was done, I put the chicken breasts into the slower cooker and it turned on “HIGH.” The soup took 9 hours to cook. The house smelled glorious all day long too.